Who hasn't worried about their weight at one time or another? This book presents an amusing new way to look at dieting. 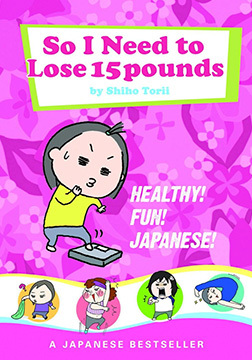 A non-fiction self-help book written in a comic format, it takes the hard issue of dieting techniques and presents them in the humorous style of Japanese “manga.” Popular diets such as Macrobiotics, based on traditional Japanese cuisine, to way out there diets such as using experimental NASA equipment and hypnosis are tested in a 27 diet challenge. Readers can find motivation to lose weight and helpful information on which diets give the best results while laughing all the way. Written in the manga format from the country that does it best, this is the how-to comic based on one young author's struggles with weight. Released in Japan November 2006, this book has sold 31,000 copies. The author's Blog was chosen the most visited Blog in the illustration division of 380,000 and the author has garnered popularity among women in there twenties and thirties as columnist. Born in 1982, after dropping out college, Shiho Torii attended a technical art institute in order to study design. However, she found herself surrounded by much older students learning art as a hobby. After finishing school, she began her career as an illustrator, drawing illustrations for novels. This is her first literary work.